In households, right across Canada, modern and contemporary interior styles are hugely popular and nothing complements those styles better than a wall mounted electric fireplace. In the past every household had to have a wood burning fireplace — it was almost the law — then there were portable floor heaters and electric radiators, but wall mounted electric fireplaces are now dominating this arena and grace the walls in a countless number of living rooms and dining rooms right around the country. If you’ve come to the conclusion that a wall hung electric fireplace would add something to the attractiveness of your home, in addition to performing a vital function, you are now faced with the daunting task of trawling through the hundreds of different models available, all with differing characteristics. Just how do you select a model that not only looks good but performs well too? During this article we are going to discuss some of the main features you will come across in your search for the perfect wall mounted electric fireplace. There are essentially two different decisions you have to make when looking for the right unit. In addition to being able to effectively heat the room, a wall hung electric fireplace must be attractive too due to its prominent position in the room. We will, therefore, split this article into design features and technical features. Color of the Surround – Nowadays it’s possible to have the surround produced in any color. When making your decision you need to ensure it fits in with the color scheme of the room and it is a good idea to match it to the color of other prominent features. Black, white, silver and wood veneers are all popular finishes for a wall mounted electric fireplace. Design Styles – Due to modern manufacturing techniques it is possible for the surround to be made in a huge range of different shapes and sizes, and again, it’s important to pay attention to other design elements in the room when choosing. Some of the options you will be able to select from include flat screen, curved panels and panels featuring bevelled edges. Most units, however, are generally rectangular in shape. Material – What materials do you have in the room already? Are the floors solid wood or do you have carpet laid down? What materials are other furniture items made from? Is the room furnished in a modern style or have you implemented a more traditional theme? These are the sorts of questions that will help you to choose the material for the fireplace surround. Some of the most popularly requested materials we have had in recent times include chrome, stainless steel, glass, wood veneer and ceramic. The Flame – The appearance of the flame and the type of lighting the unit is equipped with is another important feature that you will need to decide on when browsing through the various models of the wall-mounted electric fireplace that are on the market. There are too many options available to list here, but watch out for models that allow you to just turn on the “flame” without the heating, as this can be perfect for creating a warm cozy atmosphere on any night of the year. Heat Output – Just how well is the fireplace going to heat your home? That’s something that is vital to get right as you wouldn’t want to turn the heater on, on a cold winter’s night in Toronto, only to have to wrap up as it’s still too cold in the room. A standard wall mounted electric fireplace will possess a heat output of somewhere between 1 and 2 kW, which in most cases can comfortably heat a room up to 40 square meters. If your room is bigger you will need to look for a model with a larger output. Energy Efficiency – Now more than ever we would recommend you look out for a with a high energy efficiency rating, as this will help to protect you against rising energy costs. These models also help to safeguard our environment. Heat Release of a wall hung electric fireplace – This is something many homeowners don’t think about initially, which can be forgiven since it’s easy to overlook. You need to check whether the heat is released near the bottom of the unit, from the sides, at the top or a combination of all three. This will affect the type of decor that can be placed in close proximity to the wall mounted electric fireplace. Built-In Fan – The fan is a vital feature of any wall hung electric fireplace as it prevents the unit from overheating. It’s always wise to select a model that has a fan that turns on automatically when the unit’s core temperature reaches a certain point. To prevent overheating there should also be a cut-out switch that will automatically trip if the temperature gets dangerously high and the fan fails to resolve the problem. Control Panel – These vary from the ultra simplistic to the more high tech, depending on what kind of budget you have available. If you opt for a touch screen model, please be aware that should this break it will be impossible to control the temperature settings on the unit until a repair is made. Remote controlled units are also available to allow you to change settings from a distance. Finally, it’s essential that the wall mounted electric fireplace you buy complies with all industry regulations and is properly certified, just like those produced by Amantii. 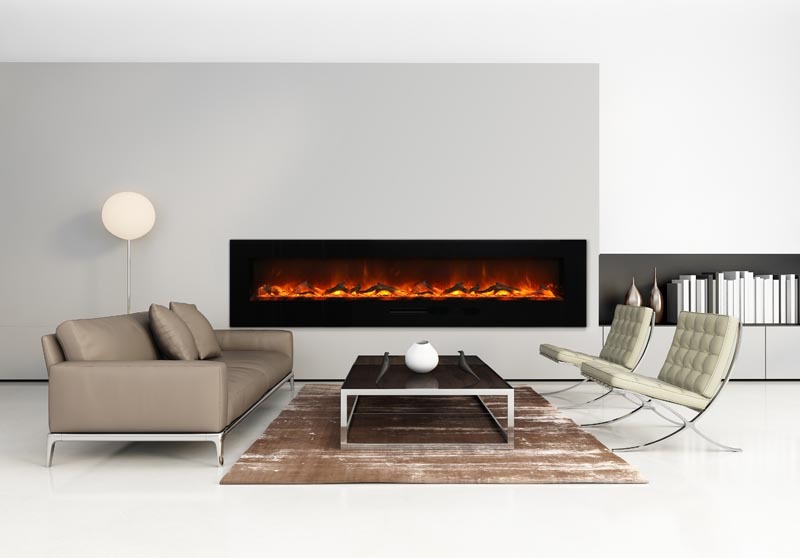 If you require an electric fireplace and are located in Toronto give our team a call on 905-669-8633.